Rome, Italy. Kiwi Jono Lester traded GT for touring cars last weekend with an FIA WTCR test with Alfa Romeo Team Mulsanne, at the wheel of a Giulietta TCR at Italy's Vallelunga circuit. 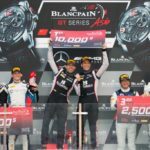 It was the first taste of front-wheel-drive FR machinery for 29-year old Lester, who has successfully established himself as a professional GT driver in Asia for the..
For the second time in three races, Kiwi Jono Lester and Australian Nick Foster's HubAuto Corsa Ferrari has taken victory in Blancpain GT Series Asia; this time at the season finale held at China's new Ningbo Speedpark. 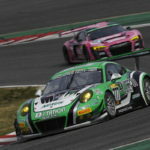 Linking up for the second half of the 2018 season, the pair have notched up an impressive record of two wins and three..
. Kiwi Jono Lester will return to Japan for the 47th Suzuka 10 Hour Race, having signed with leading Japanese Porsche team D'station Racing for the Asian leg of the Intercontinental GT Challenge. Lester impressed the D'station team with his performances in the 2017 Super GT Series, driving a Porsche 991 GT3-R with Gulf Racing, leading to his invitation to..